Have You Stopped Burning Books Yet? Below is a letter to the editor from today’s Austin Chronicle. Any word from Rep. Borris Miles on when we’ll start the book burnings [“State Representative: Let’s Hang the Artist!,” News, March 30]? And here is the article the letter was responding to. We finally got the art back and can send it back to the rightful owners. State Representative: Let’s Hang the Artist! Rep. Borris Miles, D-Houston, was walking through the Capitol with his two young children when he saw two works of art in a public corridor he didn’t like. He liked them so little that he took them down off the wall and hid them in his office. 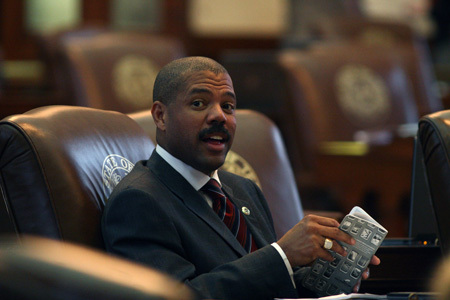 On March 12, freshman state Rep. Borris Miles, D-Houston, was walking through the Capitol with his two young children when he saw two works of art in a public corridor he didn’t like. He liked them so little that he took them down off the wall and hid them in his office. Now no one knows where they are. The two paintings were part of an exhibition intended to raise awareness of the death penalty in Texas. It contained 11 pieces, including three by artists on death row. They were exhibited March 12-17 – Texas Moratorium Week – in the main corridor on level E2 of the Capitol Extension (the bottom underground level). The artwork was selected from a larger touring exhibition, “Justice for All? Artists Reflect on the Death Penalty” (www.deathpenaltyartshow.org), which features pieces by 52 artists from the U.S., Germany, France, and the Netherlands and includes 13 works by inmates currently on death row in Texas. The full show was originally displayed at Gallery Lombardi in Austin in May of last year and in Houston’s Gallery M2 in February. 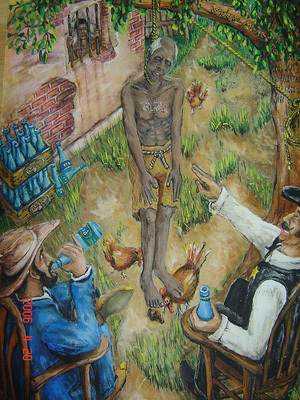 The Widow Maker by Reinaldo A. Dennes (currently imprisoned in the Polunsky Unit in Livingston) shows two white men laughing and drinking at the feet of an old black man lynched from a tree. In the background, a second, chained black man looks despairingly out of a prison window. Cuban-born Dennes was found guilty of the 1996 murder of diamond merchant Janos Szucs and is awaiting execution. 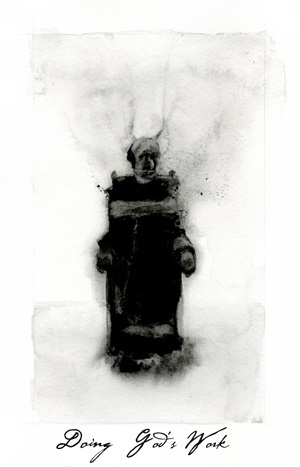 The second work, by professional artist Shanon Playford of Portland, Ore., is a monochrome watercolor showing a figure in an electric chair. The words “Doing God’s Work” – also the title of the piece – are written underneath in script. Both pieces were on loan from the artists. Miles said that part of the problem was that the pictures were displayed with no explanatory note. However, the rules established by the Preservation Board for any exhibition in the Capitol states that they do not allow “activities which promote a certain viewpoint or issue or could be considered lobbying.” Had the network included the kind of warning or labeling that Miles suggested, it might have violated this clause. Instead, the art was allowed to speak for itself. Also under board rules, all exhibitions must be sponsored by either a member of the Legislature, the governor, or the lieutenant governor. In this case, the exhibition was sponsored by Miles’ fellow Houston Democrat, Rep. Harold Dutton – a traditional foe of capital punishment, who has again filed bills this session proposing a moratorium or abolition. After several phone calls, Dutton’s office declined to comment, only confirming that Dutton had never actually seen the pictures but had indeed signed off on the Moratorium Network’s application for the exhibition. One of those Christians has now offered to buy Doing God’s Work. That is, if the picture turns up. No one seems to know where either painting has gone. Miles said he gave the pieces to Dutton, and the Texas Moratorium Network said they thought they’d be able to collect them from his office. However, as of Wednesday, Dutton’s office denied that they have the missing pictures.